Big Data Analytics with IBM Watson Analytics for Social Media. Presentation together with Behar Veliqi for IBM R&D Lab visitors from the University of Stuttgart, Böblingen, Germany, December 12, 2017. Analyzing Social Media with IBM Watson Analytics for Social Media. Presentation at the IBM Data Science Business Partner Workshop, Ehningen, Germany, November 14, 2017. An Introduction to Natural Language Processing. 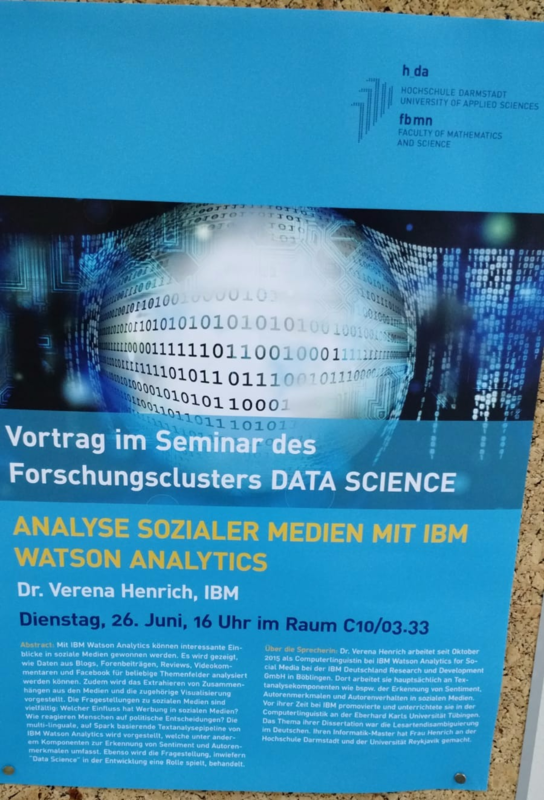 Presentation in the context of the "Watson Cognitive Hackademy" of the IBM Germany R&D Lab, Böblingen, Germany, July 27, 2017. IBM Watson Analytics for Social Media. System demonstration at the IBM TEC Technology Forum "Lab Expo", Böblingen, Germany, June 28, 2017. Audience Segmentation in Social Media with IBM Watson Analytics for Social Media. System demonstration at the 15th Conference of the European Chapter of the Association for Computational Linguistics (EACL 2017), Valencia, Spain, April 5, 2017. IBM Watson Analytics for Social Media. System demonstration at the 17th Conference on Database Systems for Business, Technology, and Web (BTW 2017) of the German Informatics Society (GI), Böblingen, Germany, March 9, 2017. Sentiment at 10000 Tweets per Second: Analyze Social Media with IBM Watson Analytics. Invited talk at the Graduiertenkolleg "User-Centred Social Media", University of Duisburg-Essen, Germany, November 8, 2016. IBM Watson Analytics for Social Media. Presentation for IBM R&D Lab visitors from the Université de Lorraine, Böblingen, Germany, February 2, 2016. Annotating Semantic Relations in German Noun-Noun Compounds. Poster presentation together with Corina Dima, Erhard Hinrichs, and Christina Hoppermann at Linguistic Evidence 2014, Tübingen, Germany, February 14, 2014. 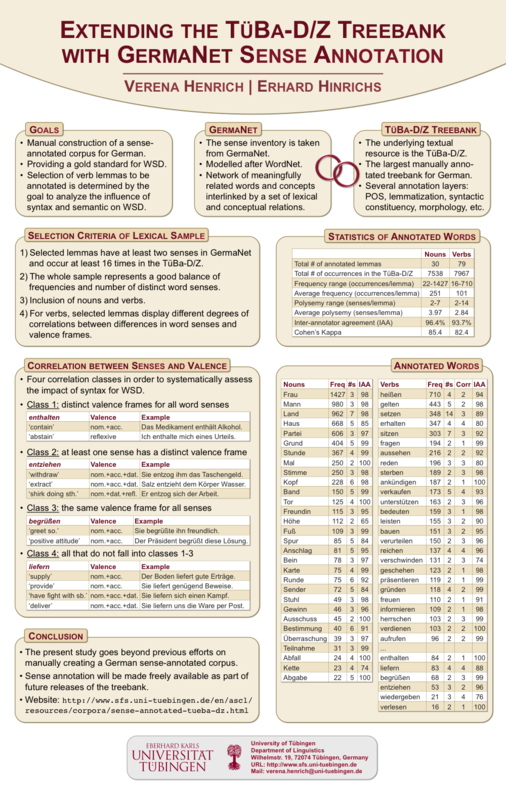 Annotation of Semantic Relations in German Noun-Noun Compounds. Presentation together with Corina Dima at the Start-of-Semester Workshop at the Seminar für Sprachwissenschaft (presenting joint work with Erhard Hinrichs, Christina Hoppermann, and Yannick Versley), University of Tübingen, Germany, April 16, 2013. 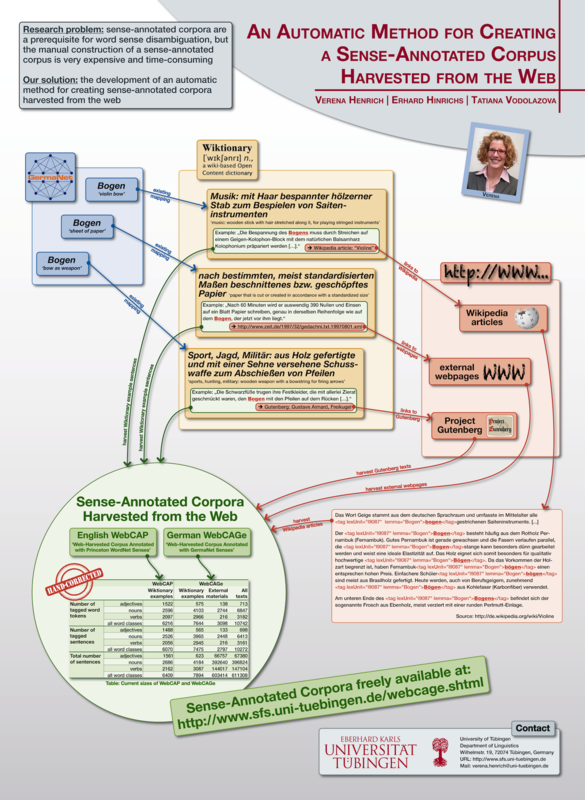 WebCAGe – A Web-Harvested Corpus Annotated with GermaNet Senses. Poster presentation at EACL 2012, Avignon, France, April 2012. Sustainability of Linguistic Data and Analysis in the Context of a Collaborative Research Center. Poster presentation at Linguistic Evidence 2010, Tübingen, Germany, February 2010. CombiTagger: A System for Developing Combined Taggers. Paper presentation at FLAIRS 2009, Sanibel Island, Florida, USA, May 2009. CombiTagger: A System for Developing Combined Taggers. Invited talk together with Timo Reuter in the Icelandic Centre for Language Technology (ICLT) seminar series given at Reykjavik University, Iceland, December 2008.